Across generations and cultures, everyone agrees on the importance of great leaders. Given the choice, anyone will clearly say they’d rather have a good manager than a bad one. We know that people leave managers, not companies, but rarely does anyone put a price on what bad managers do to drive down performance and increase turnover. When we look at a good manager vs bad manager in the workplace, no one seems to put a dollar value to that crucial difference. How much is a good manager really worth? How do you measure the value of good management? And how much does a bad manager really cost you? Today, we tackle those questions. We’ll show you step by step how you can show the difference in value for a good manager vs bad manager and apply it to your company. If you’ve ever wanted to make the case for investing more in developing your managers to be great, here’s your template. You can finally show all the money being left on the table by neglecting to improve or replace your bad managers. Sadly, there’s rarely a way to just look and clearly see the financial difference between teams run by a good manager vs bad manager. For those of you in non-sales disciplines, it’s hard to tell even where to begin. There’s a reason that Google’s People Analytics team had to do extensive studies to determine the value of managers. Fortunately, we’ve cracked the code. By combining some simple numbers about your company with key research by Gallup and others, we can create a strong estimate of the value of a good manager. Like a proof in math class, we’re going to show all our work. This way you can adjust based on your situation. Think a number is high? Adjust it down. Too low? Raise it. We use whole, round numbers as much as possible to make that easier for you. While you may need to tweak a few of our assumptions to fit perfectly, the end result will be the same: a good manager vs bad manager is no contest. Even we were surprised just how big a difference there is between them. 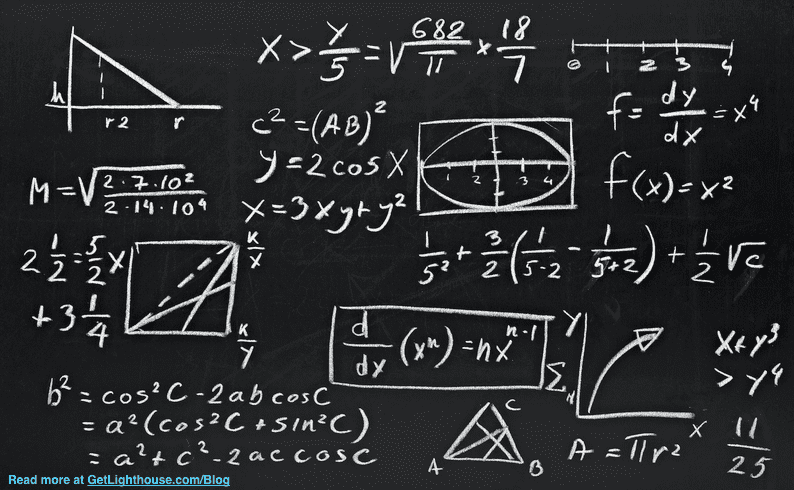 We had a few key assumptions that drive our calculations. Here’s those baseline numbers, and their sources (when applicable). If your average salary is $75,000, just multiply the number by 0.75. 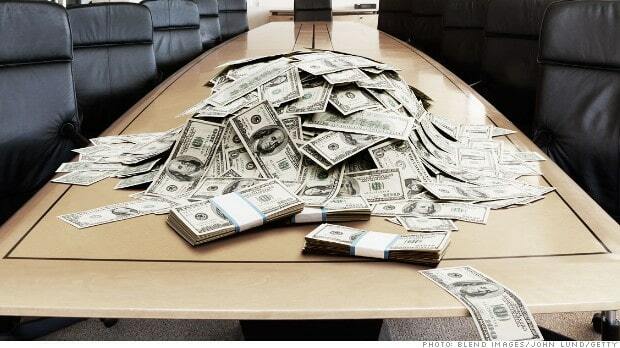 If your average salary is $150,000, just multiply the number by 1.5. According to research by Venture Capitalist Tomasz Tunguz, “the typical average revenue per employee is about $190k to $210k per year” for a venture backed SaaS company. 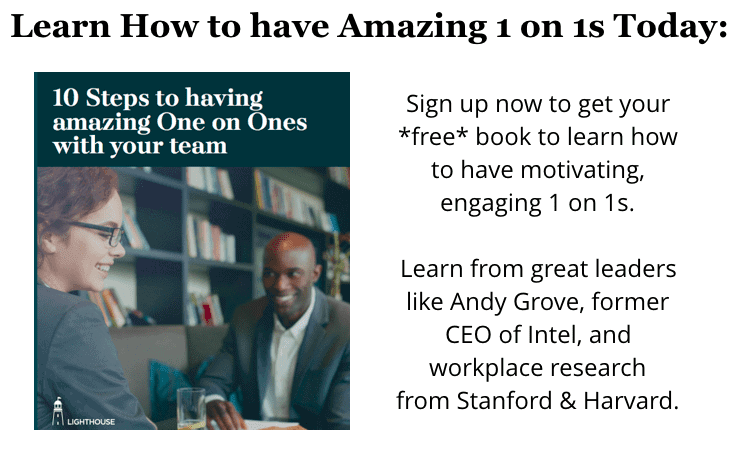 Once again, this is an easy, round number to tweak to fit your company. Experts like Jeff Bezos, Michael Lopp (aka- Rands in Repose), and Tomasz Tunguz agree that it’s hard for anyone to manage more than 10 people well. However, as companies rapidly grow, teams can often swell so that most managers have such big teams. Once again, this is also a helpful round number to easily adjust if your teams are smaller. We’ve broken down this number before, so you can see all our work on the cost of replacing an employee here. This is also based on a $100,000 a year employee salary, so everything is consistent. With these baseline numbers in mind, let’s dive into the calculations. One of the biggest differences a good manager makes is in the level of engagement of their team. According to Gallup, a manager accounts for the majority (70%) of the variance in employee engagement. While you could put a dollar value on issues like shrinkage, safety incidents, and absenteeism, we’re going to focus on the two biggest drivers: Productivity & Profitability. 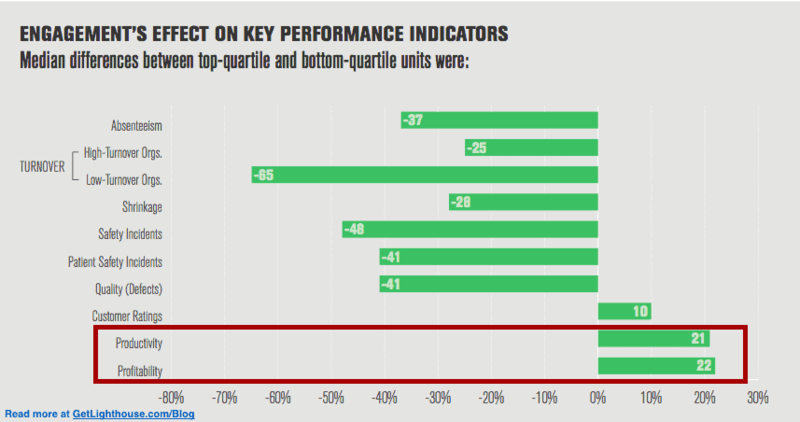 These apply to every company and happen to be basically equal (21% vs 22%). Wow! A good manager adds almost an entire additional employee’s worth of revenue just because they’ve engaged their team more effectively. Go the extra mile for a customer that has a problem. Get more done due to fewer disruptions, distractions, and conflicts. Think back to the last great manager you had. I bet you can recall situations where you and some of your team members worked harder to drive a big impact. You don’t need very many of those events throughout a year to significantly impact your bottom line. Lost productivity: You suddenly have one less person to help get things done. Sourcing: You have to spend time and money finding candidates to interview. Interviewing: You and your team have to spend time interviewing candidates. Onboarding: A new employee takes time to get up to speed and needs trained. This adds up fast. In fact, as we found, it costs you $65,500 when you lose an employee. And unfortunately, it doesn’t end there. 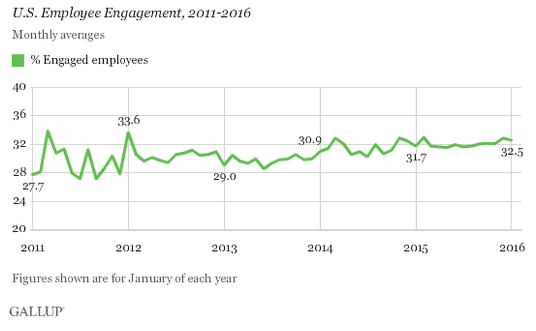 Given that employees leave in waves, and Gallup found so much of engagement is due to the manager, this makes sense. If one person is unhappy with their relationship with their manager, it’s likely some of their teammates are, too. And when one person decides it’s time to interview somewhere else, they probably tell some of their colleagues. It doesn’t take long for many on a team to seek, and obtain other jobs. If we assume a good manager is going to only lose the industry average of 1 out of 10 staff members a year (10%), a bad manager has a higher probability of having to replace a second employee. For particularly bad managers, this is likely greatly underestimating just how many people may flee their team. Depending on your company, your good managers are saving you $16,000 to $42,000 every year because they’re better at retaining their teams. If you have hard to find talent that will be more painful to replace, or really bad managers that drive away many more team members, this number can quickly skyrocket. 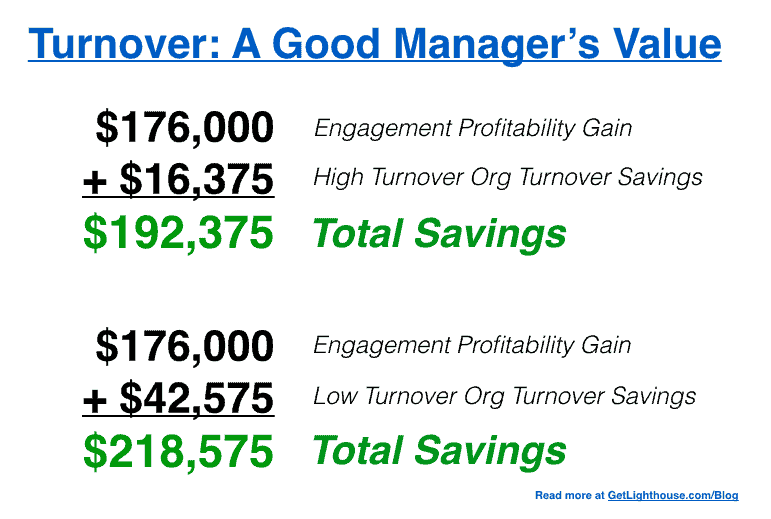 Knowing the overall value of a good manager vs bad manager for both engagement gains and turnover savings, now we can add it all up. 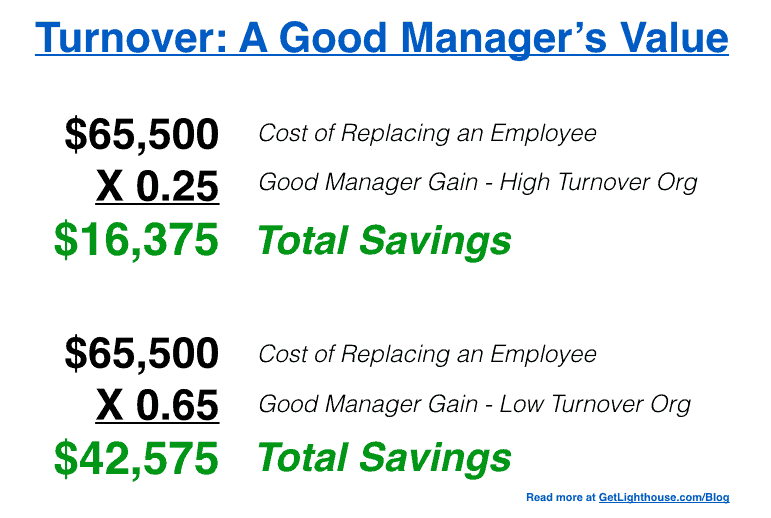 This total gain is the value of a single good manager at your company. What do I do with this number?!? 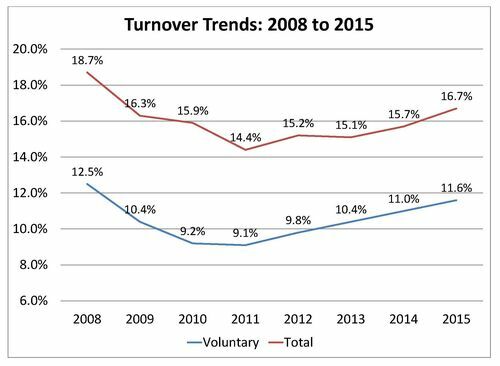 Depending on your organization’s overall turnover rate, every good manager has a $192,000 to $218,000 higher value than their bad manager counterpart. This means that any investment you make in trying to improve your bad managers can have this amount of ROI for every single bad manager you convert to a good one. If you’re trying to justify investing in new staff or programs, estimate how many bad managers you can impact. Multiply it by this number and you have the major impact you can have on your organization, regardless of your size. How do you make more good managers? Being a good manager is not a secret. It’s a series of repeatable habits that Gallup, Google, Deloitte, and many other companies have researched and applied to their teams. Training, classes, and videos only go so far. It’s the habits your managers have day in and day out that really matter to their teams. If you’re looking for help getting your managers to consistently do the habits that separate a good manager vs bad manager, then sign up for a free trial of Lighthouse or a call to learn more here. 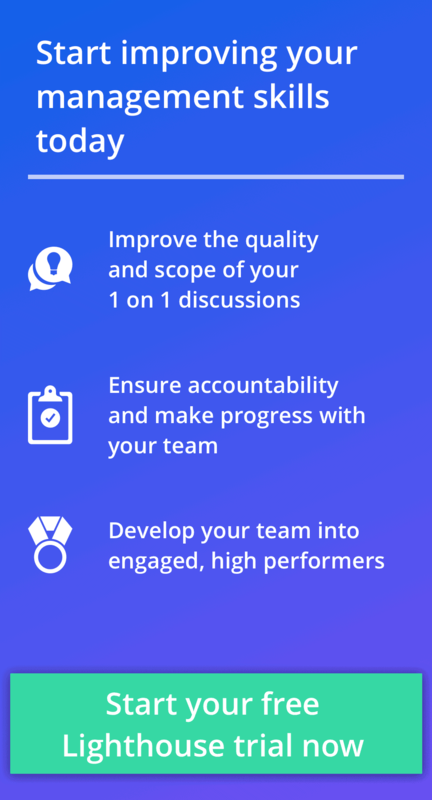 Built with the latest workplace research, and timeless management best practices, it can help more of your managers experience the gains of a retained, engaged team.